Morrow County Commissioners approved a motion to set up an account for payment of $100,000 toward the Dollar Tree road project. MOKUNT GILEAD — After discussion at their Jan. 16 meeting, Morrow County Commissioners approved a motion for Morrow County Auditor Pat Davies to set up an account for payment of $100,000 toward the Dollar Tree road project. The project will include a third turn lane on State Route 61 as well as road expansion and improvements at the Dollar Tree Distribution Center entrance at SR 61 and Interstate 71. Commissioner Burgess Castle said he would prefer that the entire local portion of the road project be paid by Dollar Tree. Commissioner Tom Whiston pointed out that the project will be to the benefit of the county. He added that the state and Dollar Tree will pay for the majority of the $3.1 million dollar project with the county’s local match of $100,000. The motion was approved with commissioners Warren Davis and Whiston voting yes and Castle voting no. The amount will be paid through Tax Incremental Formula. TIF financing is available to local governments in Ohio to finance public infrastructure improvements such as this road project. The county’s present tax structure will not be affected. The distribution center is planned to bring 400 new jobs to Morrow County. Morrow County Development Director, Andy Ware, said that he and the commissioners looked for a solution to the financing with a Bricker and Eckler associate working with Highland Local Schools, along with Nathan Green of Columbus 20/20 Economic Development. These experts recommended the TIF as a solution to pay for the local portion of the project. 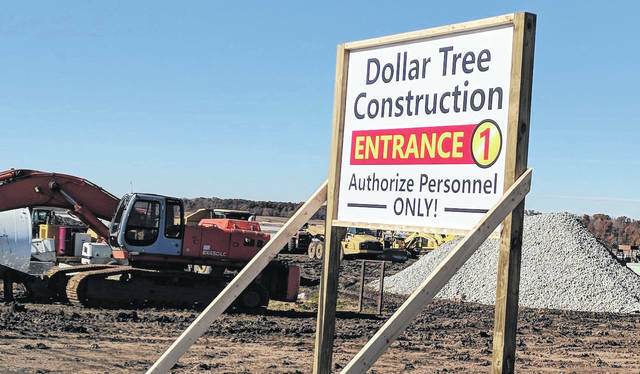 Whiston said that the agreement for Dollar Tree to pick up the overage on the project is contingent on the county approving the local $100,000 match. The original estimate of the cost for the project was $2.3 million. Due to expanded lanes, it is estimated that the overage on the project will be $900,000 for Dollar Tree. Dollar Tree operates more than 14,800 stores across 48 states and five Canadian provinces.